Hot stone massage is a speciality massage where the therapist uses smooth, heated stones in order to massage and relax the body. This type of massage has become increasingly popular with clients over recent years, as it’s known to be deeply relaxing. This course will teach you the essential skills that you need to know to offer a professional Hot Stone Massage and includes a practical training session and assessment. This GTi Hot Stone Massage course follows the National Occupational Standards and covers reception, consultation and ventilation. 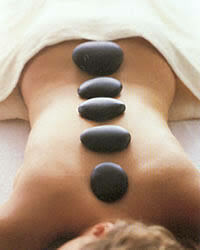 It also covers contra-indications and contra-actions, preparing for treatment, massage techniques and a full hot stone massage routine. The GTi Hot Stone Massage course includes the GTi Professional Standards course, usually priced at £49 + VAT, for all students who have not completed this course. The GTi Hot Stone Massage Award is accredited by the Guild of Beauty Therapists, the UK’s leading professional beauty trade body. Upon completion of the online theory modules, you will receive a PDF manual which you can refer back to. Seven of the modules and examinations are completed online with full online support available. You will also be assessed at a one-day assessment at your chosen practical training centre. You will have the opportunity to practice the routine on friends and family before being assessed by an experienced tutor at a time to suit you. On completion of the course, successful students will receive a GTi certificate which is acceptable for insurance purposes with The Guild of Beauty Therapists.